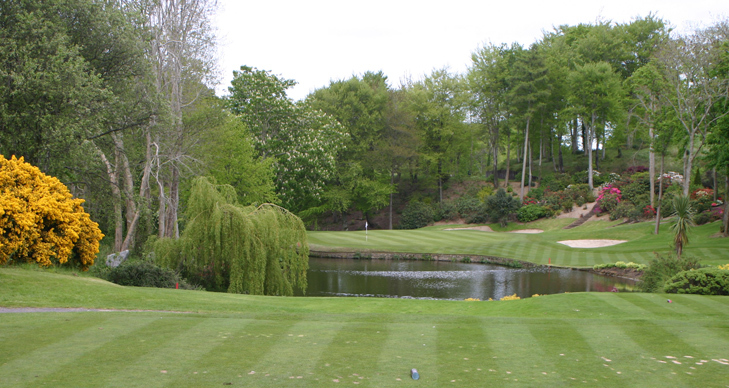 Druids Glen Hole 6: The most difficult hole on the front nine features a tricky drive on this strong dogleg right. To afford a short to mid iron, the drive must be hit long and over the fairway bunker on the right. However, that same distance shot, if pulled left, will likely go through the fairway and into a bunker or gorse. The layup shot from the tee, to the left, will leave over 200 yards to an uphill approach between mature trees. 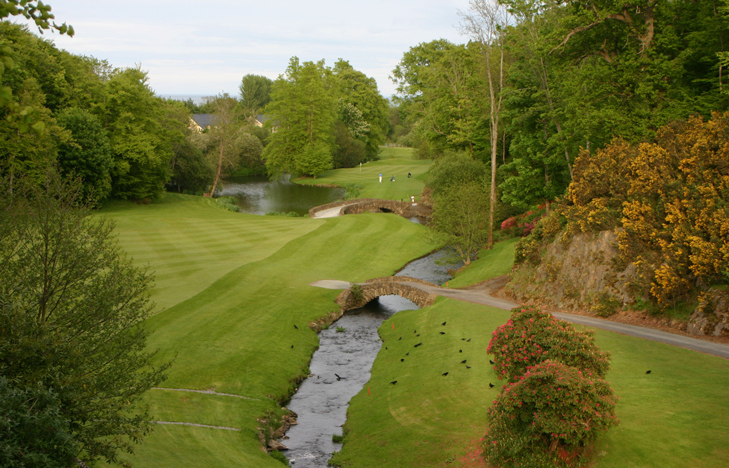 Druids Glen Hole 8: This par 3 over water highlights the magnificent landscaping and overall tranquil setting the course provides, along with a difficult shot with no bailout short or left. 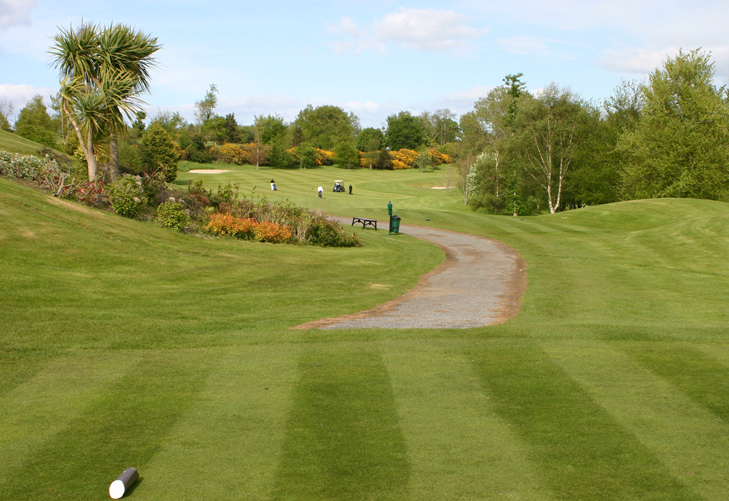 Druids Glen Hole 12 (left): The signature hole is strongly downhill, well landscaped yet again, and provides a good challenge for golfers attempting to get close to any pin on the right side of the green. Druids Glen Hole 13 (below): This is one of the most beautiful holes in the world, to be sure, with a gorse and flower covered cliff wall on the drive, a stream running across the fairway, complete with stone bridges, and a daunting approach over water with large trees surrounding. However, its flaw is that the player must play a blind tee shot right over the cliff to allow a reasonable approach to the green and that, hidden from view, is the creek, so course knowledge and many rounds must be played first to learn the hole. Druids Glen Hole 17: It is obligatory to mention most island par threes and this is no exception, with it being more tame than most as it is a large island, made larger by bunkers there to help raise the number of bogeys, but lower the “other” scores for the average golfer. 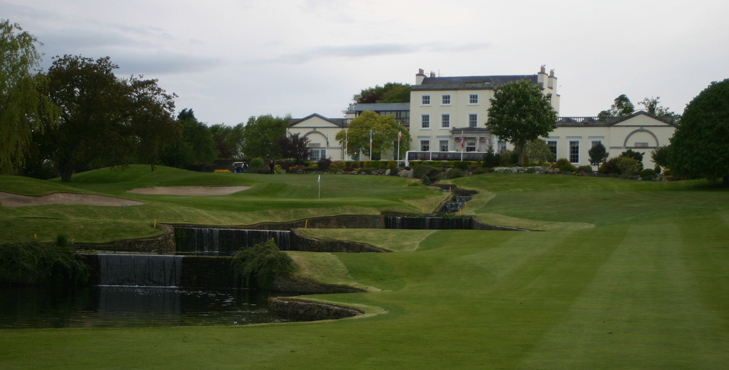 Druids Glen Hole 18: A brutal end to the day, this long, uphill par 4 requires two strong shots to make par. The final shot of the day will have to negotiate the stream and lakes meandering down from above the green and crossing in front of it. 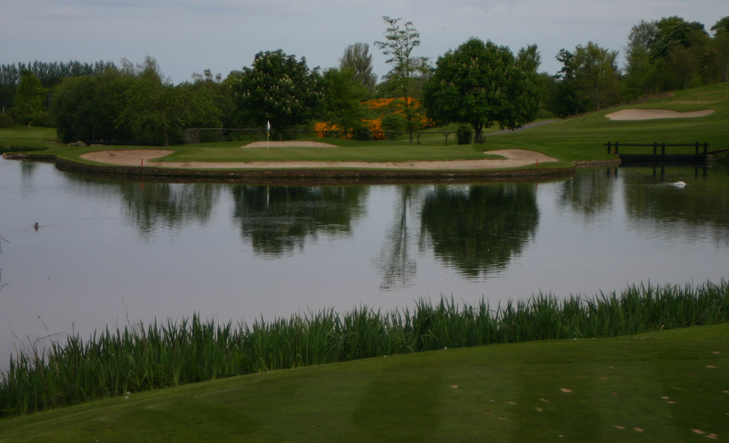 Read Druids Heath Golf Review.